Tell It To The Stars – Finished! yay! Bailey is at the shop so I plan on cleaning and checking the level of the frame for Scrapitude 2015 which is the next quilt on the quilt queue. ==> Got Bailey back and the frame is ready. I hope with this TLC everything runs smoothly. Scrapitude – Get this on the frame and get this quilted. I’m not sure if I’ll be able to get this quilted in February but I’ll be happy to get it on the frame. ==> Scrapitude is on the frame. I haven’t started quilting it yet though. #2 – Continue to count my stash, with a true effort to not add fabric on a whim. ==> I bought a yard at QuiltCon and I won a bit too. But with Tell It To The Stars finished, I was able to count that fabric out. For the first time EVER, I’m in the black. I’m ecstatic and happy about this. #3 – Create a hobby budget a stick to it! I may have bought something at my guild meeting last Monday. I’ll report it on Sunday but I’m not fairing too well with this goal. Oh well, as my first year doing this one, it’s very similar to counting stash where my numbers were way high the first year. It took 3 years before I got to where I am now with my stash numbers. I’ll just keep tracking it. I’m embarrassed at how much I spend but it is what it is. I’m sure as I keep tracking it, I’ll discover things about myself like I did when I started reporting my stash ins and outs. ==> With QuiltCon, I haven’t yet exceeded my annual budget but with it only being February, I don’t have high hopes of staying within the budget for the year. I’m going to try though. I love to support my guilds and the teachers they bring out so it will be tough. My goal for February is to get the Rosie Hat done. ==> Things have slowed down on this front. Ever since my wrist/elbow started hurting again I only work a bit on my knitting from week to week. I am still hoping to get this done in February. I just need to remind myself that this is one of the things I want to do this month. 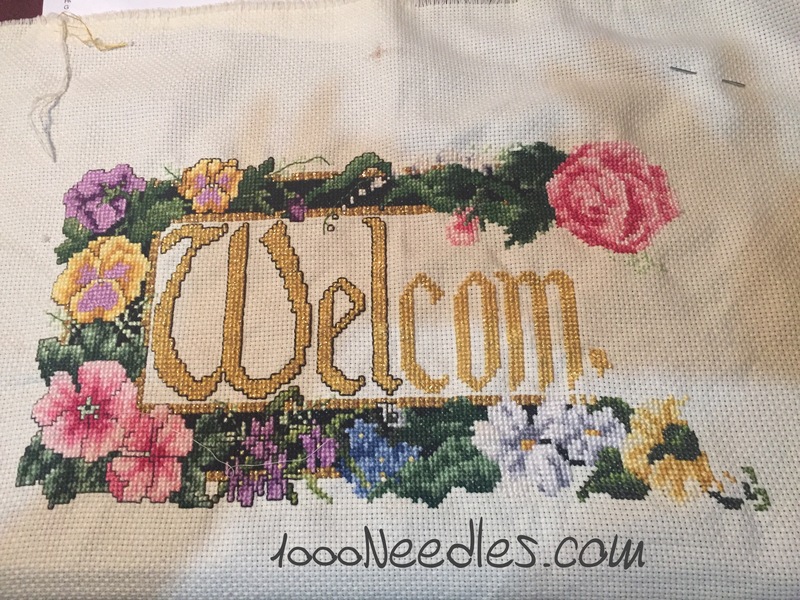 My goal for February was to get the bottom right corner complete and the letter “E” of welcome done. Here’s a pic of the project so you can see what I’m talking about. 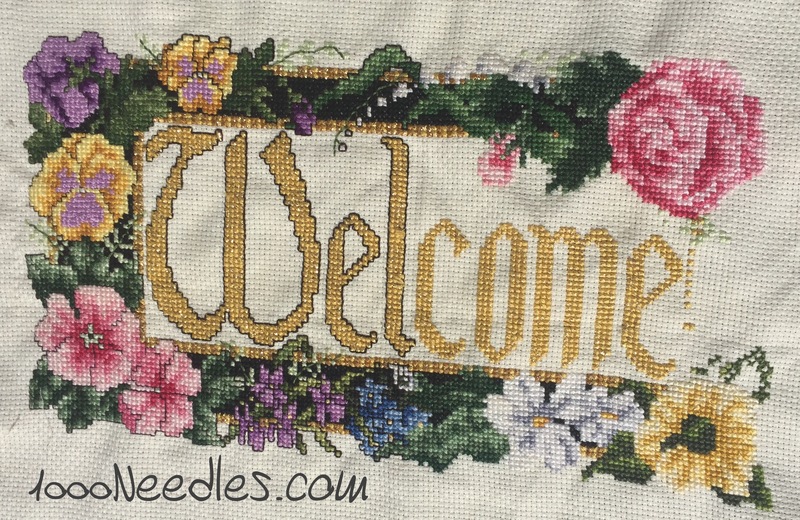 I need to take a picture but I’ve got that bottom right corner complete so the next thing I will be working on is the “E” of welcome. I’ve also started outlining some of the details on the bottom border. ==> Last half of February I didn’t do much on this project. But here’s where I ended the month at and I’m happy with my progress. I hope I have more time to spend on this on March. For February, I want to get those pictures onto pages. I also want to go into one of my project bags to see where I left off. Ideally, I’d like to start where I left off so I can empty out the project bags and use them for my 2015/2016 album. ==> I still haven’t done anything on this. /boo There was just not enough time to do everything I want to do this month. Here’s a link to my original 2016 Goals.